The Committee on Intellectual Property (CIP) is pleased to announce the posting of the revised and expanded Intellectual Property and the Arts pages on CAA’s website. CIP monitors and interprets copyright legislation for the benefit of CAA’s various constituencies. In so doing, it seeks to offer educational programs and opportunities for discussion and debate in response to copyright legislation affecting educators, scholars, museum professionals, and artists. The section is divided into the following eight categories: US Copyright: Fundamentals & Documents; Visual Art/Visual Artists; Publishing in the Visual Arts; Libraries, Archives, and Museums; Image Sources and Rights Clearance Agencies; Fair Use Guidelines, Practices, and Policies; Copyright Outside the United States; and Legal Assistance. Education is essential for informed communication. The committee hopes that the resources presented in the updated pages will answer your questions about intellectual property and inform your discussions and debates. The principal author of the brief, Jennifer Urban of the Samuelson Law, Technology, and Public Policy Clinic at the University of California’s School of Law in Berkeley, received assistance from Cunard and his firm, Debevoise & Plimpton LLP. Others signing onto the brief include individual writers, musicians, and scholars as well as other organizations. Cunard extends his thanks to Anne Collins Goodyear, curator at the National Portrait Gallery and CAA vice president for Annual Conference, for providing the excellent example of a visual artist, Marcel Duchamp, using a public-domain work, the Mona Lisa, to create a new one (pp. 14–15). The brief also cites other artists, from Pablo Picasso and Jasper Johns to Banksy and Shepard Fairey. In addition, Cunard has noted the extensive reference to CAA’s involvement in the orphan-works proceeding (pp. 33–35), which helps the brief support the proposition that the URAA’s copyright restoration of many foreign works had exacerbated the orphan-works problem. CAA’s involvement in Golan v. Holder is the latest event in its long history of advocacy efforts regarding freedom of speech and copyright issues. On behalf of all CAA members, the board is grateful to Cunard, one of the nation’s leading experts in copyright law, for the work he has put into the brief and for his continued support of the organization. CAA is the principal national and international voice of the academic and professional community in the visual arts; the organization was founded on the principle of advocating the visual arts and actively continues that engagement today (see The Eye, The Hand, The Mind: 100 Years of the College Art Association, edited by Susan Ball). The principal goal of CAA advocacy is to address issues of critical importance in the visual arts that benefit artists, art historians, and museum workers and to inform the public. CAA cosponsors and regularly sends representatives to the annual Arts, Humanities, and Museum Advocacy Days in Washington, DC. Email petitions are requested of CAA members throughout the year when legislation is being considered in Congress related to specific issues. This year’s advocacy message to Capitol Hill focused on maintaining the funding levels of the National Endowment for the Arts and the National Endowment for the Humanities. In addition, CAA has been involved in intellectual-property rights, as described below. CAA participated actively in US Copyright Office proceedings to study orphan works and, thereafter, actively supported legislation—yet to be passed by Congress—that would require users to conduct work-by-work, due-diligence searches to identify and find the copyright holder. If that search failed to identify or find the copyright holder, the work could be used without the threat of injunctive relief or statutory damages. If the copyright holder emerges after the work has been researched and used, he or she could still sue the user for copyright infringement, but a losing defendant would only be required to pay the normal license fee; the proposed legislation includes a safe harbor for museums that removed works expeditiously. It is unclear if any orphan-works legislation will be reintroduced in this or subsequent Congresses. After the March 2011 decision of Judge Denny Chin of the US Court of Appeals Second Circuit rejecting the settlement of the Google Books litigation, CAA’s counsel was approached by Public Knowledge (“a D.C. public interest group working to defend citizen’s rights in the emerging digital culture”) asking if CAA remained interested in orphan-works legislation and, if so, to sign a letter to Congress requesting that orphan-works legislation be reintroduced. In recent member surveys, one of the most critical issues articulated was the high cost of reproduction rights of works in museum collections that are not under copyright. CAA has requested formal attention to this issue from the Association of Art Museum Directors. CAA’s Committee on Intellectual Property, chaired by Doralyn Pines and Christine Sundt, is reviewing and proposing revisions to the Intellectual Property in the Arts section of the CAA website. The committee will also review a draft set of fair-use guidelines being prepared by the Art Law Committee of the New York Bar Association and the Visual Resources Association; after such review, the CAA Board of Directors may be asked to endorse the updated guidelines. CAA signed a Supreme Court amicus brief regarding the retroactive application of the extension of copyright term in Eldred v. Ashcroft. The Copyright Term Extension Act of 1998 was challenged with the original complaint filed on January 11, 1999. 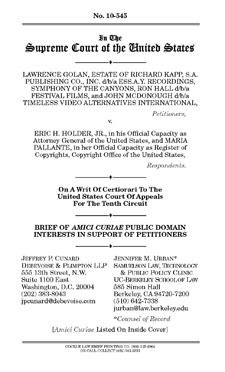 CAA was an amicus when the case was brought to the Supreme Court, which held on January 15, 2003, that the Copyright Term Extension Act of 1998 was constitutional (see the March 2003 CAA News). CAA actively supports the Artist-Museum Partnership Act, which establishes fair-market-value tax deductions for works given by artists instead of the current limitation to cost of materials. Information on the progress of the Artist-Museum Partnership Act is published in the weekly CAA News email, posted in the Advocacy section of the website, and communicated to the Services to Artists Committee. If and when a bill is subject to a vote in Congress, CAA will urge all members, affiliated societies, and committees to contact their representatives. CAA is a member of the Coalition on the Academic Workforce, which recently prepared a survey of contingent faculty. Over 30,000 individuals completed the questionnaire—many were CAA members—and the results will be tabulated this spring. Information on all aspect of working conditions is included in this survey and will assist in informing future standards and practices. CAA’s Professional Practices Committee and Education Committee are kept informed of the survey and its tabulation and will analyze the results and determine action to take that will benefit CAA members. Contingent faculty is currently responsible for 76 percent of teachers in American colleges and universities. CAA supports equitable hiring, representation, and benefits for this growing segment of the faculty. How does advocacy work at CAA? CAA both monitors advocacy issues and is approached by universities, colleges, organizations, and individuals who raise issues via CAA’s counsel, officers and members of the board, executive director, deputy director, affiliated societies, or other partner organizations such as the National Coalition Against Censorship, the Association of Art Museum Directors, or the associations of the American Council of Learned Societies. If an issue warrants action and is consistent with the advocacy policy, CAA will prepare a response. Depending on the importance and complexity of the issue, CAA will prepare an email, letter of support, or statement; cosign a letter with other organizations; or, in exceptional circumstances when legal action is required, prepare an amicus brief or support proposed legislation. All advocacy issues brought to CAA’s attention are reviewed by the counsel and the executive director. Consistent with the organization’s Advocacy Policy, the Executive Committee and, if necessary, partner organizations also review the issues. Important matters where legal action is involved will be brought to the board. At the February 2011 board meeting, Andrea Kirsh, then vice president for external affairs, volunteered to work as CAA’s advocacy coordinator. She has since actively assisted in carrying out research and drafting letters and statements. CAA members who would like to be informed of the organization’s advocacy efforts—and spread the word—can send an email to nyoffice@collegeart.org. During summer 2010, Linda Downs, CAA executive director, and Andrea Kirsh, then vice president of external affairs, visited more than a dozen deans and chairs of art and art-history departments in New York and Philadelphia to better understand the needs of their students and faculty. One topic that arose among studio artists was CAA’s stance on orphan works, which some perceived as not protecting artists. Downs explained that CAA was indeed aware of balancing the interests of artists and art historians. Following this, the Board of Directors thought that all studio departments should understand CAA’s position and has thus sent the following letter to them. This letter is intended to address concerns about CAA’s advocacy on behalf of orphan-works legislation. An orphan work is any copyrighted work—book or other text, picture, music, recording, film, etc.—for which the copyright owner cannot be identified or located. Everyone recognizes that there is an orphan-works problem. The inability to clear rights for orphan works often precludes their use, by scholars, publishers, students, and creators. The US Copyright Office documented the considerable extent of this problem, and the CAA submitted comments to the Copyright Office describing the adverse effect of the orphan-works problem on artistic creation and scholarship. The Copyright Office recommended legislation that would amend copyright law to allow orphan works to be used without an undue risk of suit to the user—of statutory damages or an injunction—assuming that the user conducted a diligent search for the copyright owner and properly attributed the work as an orphan work. That has been the basis of the legislative proposal seriously considered by Congress. CAA has only supported those proposals which are appropriately balanced. Should the copyright owner pursue and prevail in an action for infringement against a user, the legislation requires appropriate compensation for use of the work. In advocating for orphan-works legislation, CAA has taken full account of the concerns of artists, designers, and photographers that such legislation, if enacted, would allow bad-actor copyright infringers to avoid statutory damages or injunctive relief. The legislation supported by CAA would require users to conduct diligent searches, with the parameters of such a search elaborated in the legislation itself, to identify and locate copyright owners as a precondition of having such works become eligible for orphan-works treatment. The last legislative proposals, supported by CAA, are detailed and meaningful, but they also are not inappropriately or unduly burdensome. They include searches of Copyright Office records and the use of other appropriate databases and other resources. In any litigation, the burden would be placed on the users to demonstrate that their searches complied with the requirements of the law. CAA is aware of fears that artists whose works cannot easily be signed, or have other identifying information attached to them, that are “born orphan” because they never are associated with identifying information, or that can easily be stripped of identifying information and be made available on the internet, are or might readily become orphaned. Concerns have been expressed that such works could be used unfairly and unscrupulously, without appropriate compensation and attribution. Other concerns have been raised that users might prefer to use works that appear to be orphaned (and avoid having to pay for them) in lieu of engaging creative artists to create new works. CAA is not unmindful of these concerns. CAA encourages artists to consider the advantages of registering their works with the US Copyright Office (www.copyright.gov/eco/). A diligent search under orphan-works legislation would include the office’s records. For CAA’s statement on orphan works, please refer to www.collegeart.org/publications/ow. If you have further concerns about the implications of orphan-works legislation, we would be happy to discuss them. At Arts Advocacy Day 2011, CAA representatives from five states—Connecticut, Georgia, Pennsylvania, New York and Texas—will meet congressional staff to advocate for the visual arts in higher education. Organized by Americans for the Arts, of which CAA is a member institution, the annual event will take place April 4–5, 2011, in Washington, DC. CAA delegates will address the following issues of critical importance and invite you to register and get involved. As the leading association in the world that represents professional visual-arts practitioners, CAA endorses government support of creativity and innovation that has made this country great. CAA seeks support for artists and art historians who work in colleges, universities, and art museums, as well as for independent artists and scholars. The federal government must support professionals in the visual arts like it does for practitioners and scholars in other arts, such as dance and music. The professional practice, study, and teaching of the visual arts deserve further support because of the power these disciplines have to educate, inspire, and stimulate independent thinking. CAA also believes that public and private partnerships should expand not only between schools and communities but also among the academic community in colleges, universities, and art schools. CAA fully endorses the creation of an art corps comprising professionally educated artists and art historians who will work with students in urban schools on community-based projects, raising an awareness of the importance of creativity and professional artists. CAA also encourages government-sponsored projects such as Americorps and Vista to emphasize the visual arts. Young artists are eager to work on environmental programs that involve community-organized design projects such as, for example, mine-reclamation endeavors in which community recreation centers are established near cleaning pools for toxic mine runoff to help redevelopment the land. CAA would like to emphasize that, in order to champion publicly the importance of arts education, America must support the preparation of artists and art historians who teach on a primary, secondary, and college/university level. The visual arts are integral to core curricula in each grade and at every stage of education. CAA fully supports increased funding for the National Endowment for the Arts, the National Endowment for the Humanities, and the Institute for Library and Museum Services. Specifically, professional artists must supported on individual bases. CAA strongly recommends that the NEA reinstate Individual Artist Fellowships, so that visual artists can pursue and develop their work. Similar grants in other areas of the arts and humanities far exceed federal and private foundation grants to professional visual artists, who are often forced to abandon their own work to support themselves and their families. Professional artists desperately need government support. CAA supports legislation to change tax laws for artists. The organization has worked hard—and will continue to work hard—to support the Artist-Museum Partnership Act, first introduced by Senator Patrick Leahy (D-VT) in 2005. The proposed act would amend the Internal Revenue Code to allow artists to deduct the fair market value of their work, rather than just the costs of materials, when they make charitable contributions. Not only has the current tax laws been harmful to artists, the creative legacy of a whole generation of American visual artists has been lost. In addition, CAA supports legislation that would allow scholars to publish so-called orphan works, which are copyrighted works—such as books, pictures, music, recordings, or films—whose copyright owners cannot be identified or located. The House of Representatives and Senate has previously introduced orphan-works bills, and CAA hopes Congress will pass one in the coming session. The lack of clear laws and procedures regarding the issue has prevented many art historians from publishing orphan works, causing a great detriment to scholarly publishing and research. CAA supports cultural diplomacy by enhancing international opportunities, through agencies such as the United States Information Agency, for professional visual artists and art historians to exhibit, teach, research, and lecture. CAA’s international membership testifies to the promotion of cultural understanding that occurs through international cultural exchange. Every year CAA seeks funding to support the travel of international art historians and artists to our Annual Conference. Current Homeland Security laws and a lack of government funding make it difficult for foreign art historians and artists to present their work and research at conferences, symposia, and exhibitions. CAA endorses streamlining the visa process and providing government support for international exchanges of graduate students and professional artists and art historians. CAA supports providing healthcare to independent artists and scholars—a major concern for those professionals who are not associated with a college, university, or art museum and who attempt to work on their own to support themselves. Each state creates its own health-insurance legislation, and thus differences in laws regulating insurance companies prohibit professional organizations such as CAA from offering national healthcare coverage. CAA invites members in the tristate area of New York, Connecticut, and New Jersey to attend an upcoming panel on orphan works, entitled “Lost and Found: A Practical Look at Orphan Works.” The program is free and open to the public, but registration is required. How should the law treat “orphan works”? Please join us as we discuss proposals that would enable copyrighted works to be used when their owners cannot be located to obtain necessary permissions. What should be the obligations of potential users with respect to searching for copyright owners? How should infringement claims be handled if a copyright owner emerges? Do different types of copyrighted works present unique issues? What roles might registries and recognition and detection technologies play? Our speakers will address these and related questions, focusing on orphan images. “Lost and Found” is sponsored by the Art Law Committee (chaired by Virginia Rutledge) and the Copyright and Literary Property Committee (chaired by Joel L. Hecker) of the New York City Bar Association, in conjunction with Columbia Law School’s Kernochan Center for Law, Media, and the Arts. The negotiations went on for hours and hours on [October 2–3], but in the end, PK, working with the user community (libraries, documentary filmmakers, educational institutions and the College Art Association) could not agree with on language with the House staff…. Time had run out. Though several matters remained unresolved, which Sohn discusses, she was proud of the progress made so far and is pleased that the issues surrounding the documentation of a good-faith search have been narrowed so that future legislative efforts may be more fruitful.